Hotel Management Systemdedicated to small and medium accommodation facilities. AsiaTech’s channel and distribution manager is a distribution platform that manages your inventory exposure to the Online Travel Agencies (OTA) and the Global Distribution System (GDS). 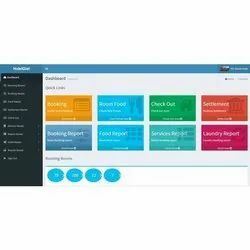 V T L Global Inc.
Hotel Management System is an ideal software solution for Hospitality Industry that can be used at hotels, motels, inns, resorts, lodges, hostel, military guest houses, ranch, suites, apartments, medical centres and bed, breakfast operations. Our product Hotel Management System is a comprehensive software suite consisting of integrated modules for various aspects of hotel management. The MGHworld hotel management system is used by over many hotels across 450 cities to save time and money. Hotels can manage their frontdesk, point of sales, accounts and much more using just one login. The cloud based hotel management software enables hoteliers to easily manage their operations from anywhere. The IT Headway offer the chance to buy hotel software in installment. This offer only for Indian Customer.